The goal of any good dentist is to help you keep your teeth forever. That means offering great preventive dentistry and quality restorative dental needs. But even while our Reading MA dental office is here to help you maintain a great smile, there are still millions of Americans struggling with failing or missing teeth. Most people with missing teeth didn’t wake up one day and find themselves with a dental crisis. The problems developed over time. At First Dental Associates, we aim to educate patients about the risks of losing teeth and what it means for their smile and overall health. We also have revolutionary ways to restore your mouth. Give us a call today at 781-694-1156. As I mentioned before, people don’t develop failing teeth overnight. Bad teeth, and even teeth beyond repair, are caused by three things: trauma, dental decay, or gum disease. You might be surprised to learn that gum disease, not dental decay, is the leading cause of tooth loss. Gum disease is often underestimated by the general public. It can start with bleeding or swollen gums and quickly take over your mouth. Gum disease can erode the gums and then bone, causing the tooth to become loose in the socket and fail. Unfortunately, some people don’t even know there is a problem until it’s severe. Gum disease will affect more than 50 percent of American adults, and it’s only curable in its early stages. We’re offering state-of-the-art gum disease treatment that will keep your gums and teeth healthy. The most obvious issue with missing teeth is that it causes gaps in the smile. The gaps caused by missing teeth stick out everytime we laugh, smile, or speak. But there is also something happening under the gum line that is less apparent. You see, your jawbone serves as an anchor for your permanent teeth, and when those permanent teeth are lost, the jawbone will begin to recede. This jawbone recession changes the shape of your face. People without teeth often develop wrinkles around their mouth, and their nose and chin get closer together. All of these issues make it hard to stabilize your dentures, and unfortunately, you’ll lose your youthful appearance. If you have failing teeth or missing teeth, you’ve probably looked into ways to replace your teeth. Dentures are the most common way to replace your missing teeth. We dentists have used dentures for years to replace missing teeth. 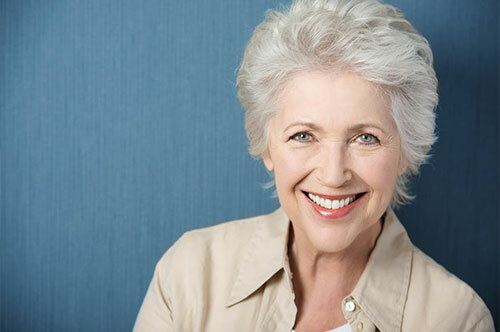 At First Dental Associates, you can expect dentures that are lifelike and durable. We’re even using special partial dentures that do not have metal clasps and are flexible and nearly unbreakable! A good denture should fit perfectly, look lifelike, and be high functioning. If your dentures don’t match this, then you need to consider replacing your dentures with something that will match your smile. As much as we pride ourselves on crafting beautiful dentures, the fact remains that removable dentures are not fixed in the mouth. Dentures, even great-fitting dentures, can slide around in the mouth, making it difficult to eat the food you love. In fact, many of your favorite foods might be off the menu! Dentures also can’t stop jawbone recession, so your face will continue to change shape. Dental implants can give you great teeth that will never budge. The implants are made from titanium, a metal that naturally fuses to bone. Because the titanium actually merges with the bone, it serves as almost like a new root for your permanent teeth. These implants will preserve the jawbone AND your youthful appearance. Once the implant has healed, we can restore them with anything from single crowns to full dentures! If you have missing teeth are failing teeth, our office has options for you. You can have a youthful, functional smile again. Give our office a call today at 781-694-1156 to get started, or use the online form to schedule an appointment.